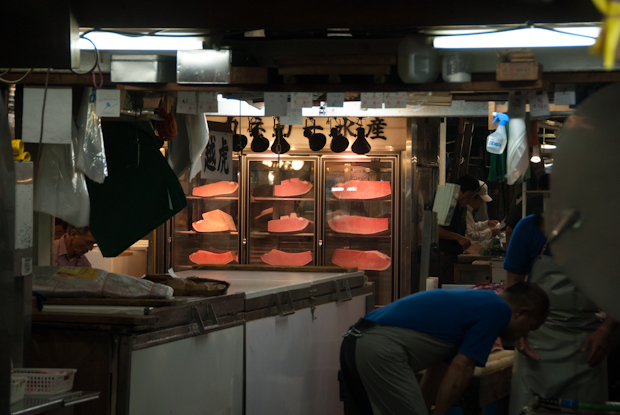 Fish seems to be the japanese staple, second only to rice. 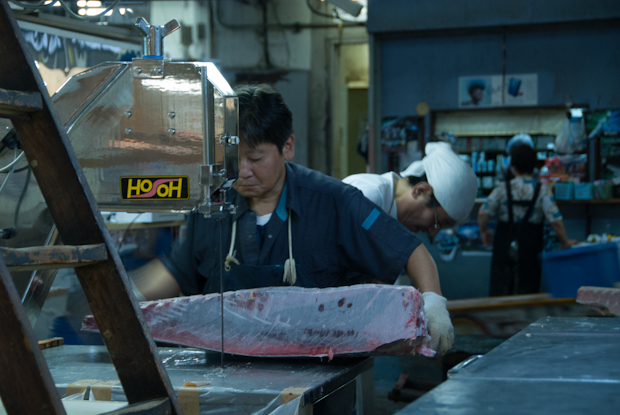 On its way from the ocean to the supermarkets and sushi restaurants of Tokyo, a lot of it passes through Tsukiji Fish Market. 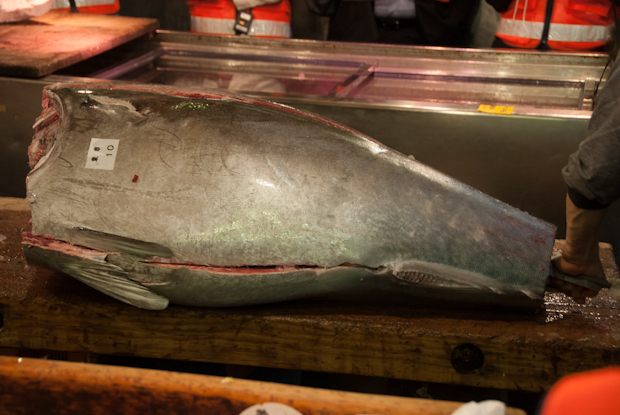 I have to see this happening, but I don’t like what the internet is telling me: To visit the fish market you have to get there before 5 a.m in the morning, stand in line hoping to be one of the 120 lucky ones, who get a ticket to see half an hour of the tuna auction from a designated observation area. As the Metro does not run that early, I would have to take a taxi. Yes, there is a “last train” in Tokyo, a fact that results in a “black hole” in public transportation, that can easily get you stranded through the early hours. Over a beer I get the information that I can forget about getting a ticket, if I’m not in line before 4 a.m. Great. Do I want to see the market that bad? Then I have a beer with Jim. We team up. The plan ist to get there at a decent time and see what happens. 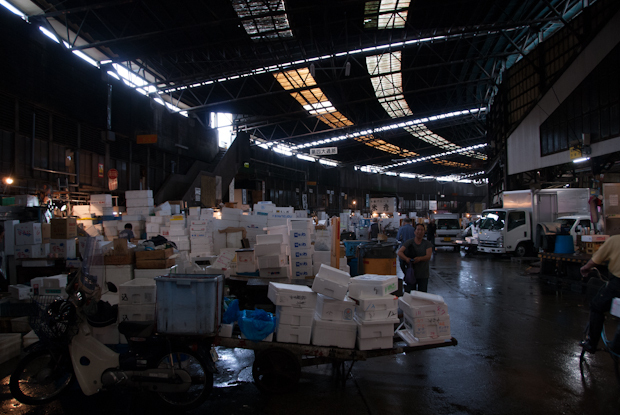 We get to the market at about 6 a.m. and walk straight through the main gate into a bustle of carts, trucks, bikes, … you name it. We keep walking through this logistics pre-hell until we reach the maze. All around us things are moving. Electro carts, fork lifts and all kinds of machinery are appearing out of nowhere and disappearing somewhere mere seconds later. My head keeps turning at high-speed. This place is dangerous, as in accidents can happen fast. With a high dose of adrenaline in my system we enter, watching each others backs. There are two kinds of passage ways, the ones too small for the carts, where we squeeze through piles of styrofoam boxes, aquariums, deep freeze units and working tables full of really sharp knives. Marine life, dead or alive, is all around us. 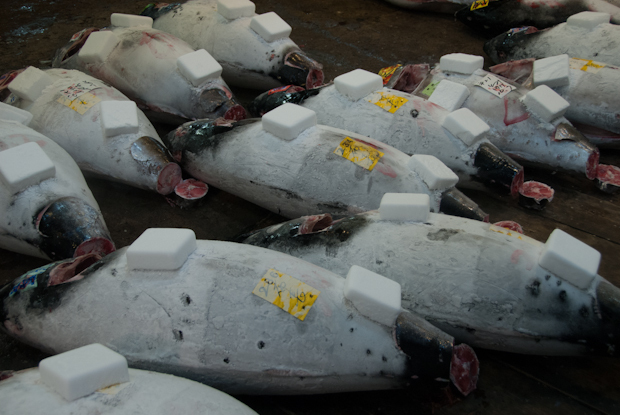 Frozen tuna carcasses on carts and on the ground. Dry ice on their back. The other kind of passage way is a race track for electro carts. We spend half of our time getting out of way and try not to interfere with the action and mayhem all around us. Then we meet a group of people dressed in bright orange vests with cameras and what appears to be a guide. We join them. 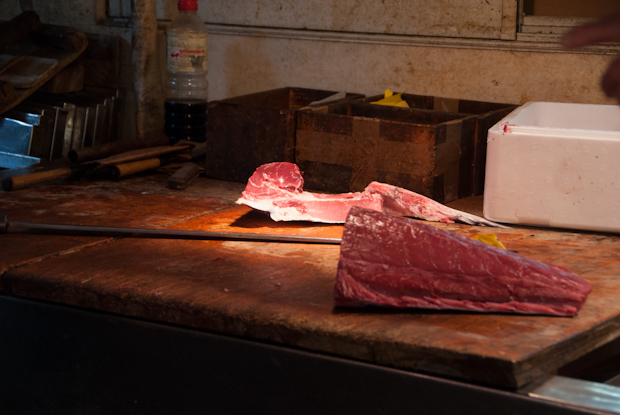 We see experts cutting up tuna more than a meter long using knifes about the same length. You don’t want to get in the way. Everything happens really fast. 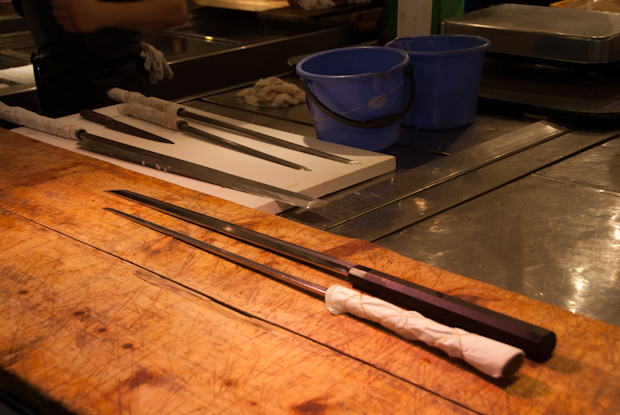 Knives won’t work for frozen fish. So there are other ways. Finally the cutting cedes and the cleaning begins. 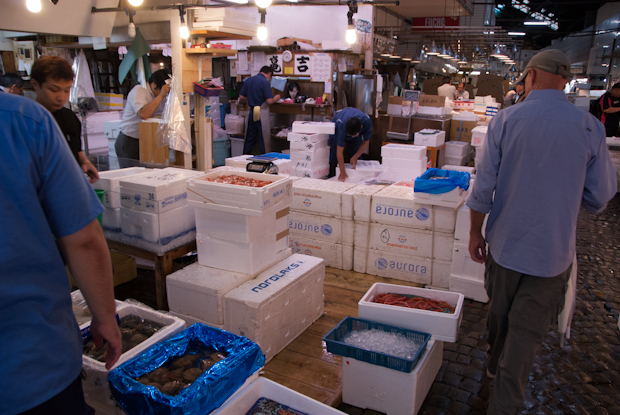 We leave the inner market and look for a place to cool down from the excitement of the last two hours. 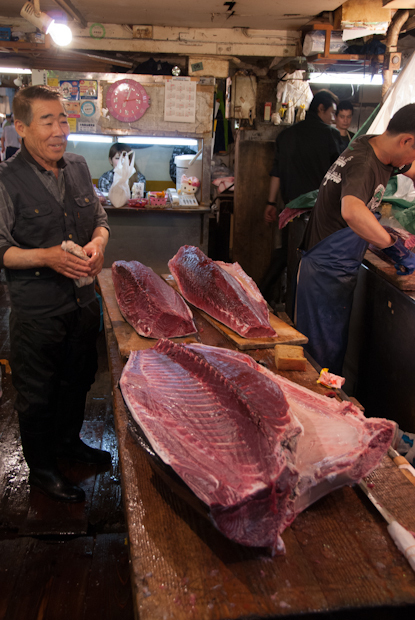 We find the restaurant area, pick one with a line in front and have tuna sashimi on rice. Well, it is excellent. What else can I say. We decide to have a look at the Ginza close by, but when we get there the shops are closed. We’re too early. How to top such a morning. I have no idea.